WHY did the Prophet Muhammad start using henna in his later years? Starting after the age of 40, he began to dye his greying beard red to gain a more youthful appearance, as the Prophet Mohammed himself was reported to have NATURALLY red hair when he was young. 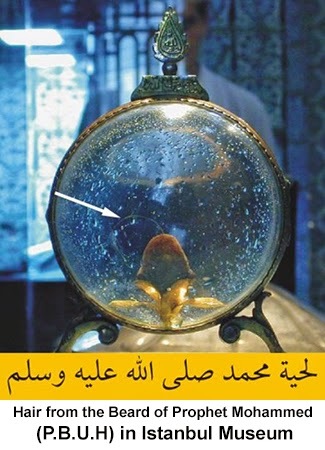 This image (left) is said to be of actual hair from the beard of the Prophet Mohammed. Known in Turkish as the Sakal-ı Şerif, the beard was said to have been shaved from Muhammad's face by his favoured barber Salman in the presence of Abu Bakr, Ali and several others. Individual hairs were later taken away, but the beard itself is kept protected in a glass container. The Islamic men pictured below, with reddish/orange henna-dyed beards and hair, are Muslim followers living many centuries AFTER the time of the Prophet Mohammed. The same way that DNA evidence has demonstrated the 99% of MODERN day Egyptians are NOT genetically related to the blond and red-headed Pharaohs, the vast majority of Muslims today have no ethnic relation to the Prophet Mohammed, yet still dye themselves with RED henna out of respect, tradition, and imitation. "Of Roman origin and blond, Byzantine lineage, fostered by the possessors of inner virtue, lineal glory, and greatness among the blond ones . . . soft-skinned ones among whom neither the Egyptians nor the Nabateans have implanted; family honour well-guarded and noble lineage." The fourteenth-century historian Ali ibn Abd Allah, in his Roudh el Kartas, described a Moorish Sultan of the time, Muhammed ben Idriss, as "blond". The link given below, leads to a web page which contains depictions of every one of the Ottoman Sultans. It is interesting to observe how many have reddish hair, light eyes, or a fair complexion. As for the present leadership of the Arab world, Henric von Schwerin has pointed out the extent to which it tends towards blondness and the Nordic type. Baltzer, H. (1934) Rasse und Kultur: Ein Gang durch die Weltgeschichte (Weimar: Alexander Duncker Verlag). Dunan, M & J. Bowle (eds.) [D. Ames & G. Sainsbury, trans.] (1968) Larousse Encyclopedia of Ancient and Medieval History (Feltham: Paul Hamlyn). Fossier, R. (1968) "The Beginning of Europe's Expansion." In Dunan & Bowle (1968) pp. 298-321. Gayre of Gayre, R. (1972) Miscellaneous Racial Studies, 1943-1972: Volume II (Edinburgh: Armorial). Grant, M. (1981) Dawn of the Middle Ages (London: Weidenfeld & Nicolson). Guillaume, A. [trans.] (1987) The Life of Muhammad: A Translation of Ibn Hisham's "Sirat Rasul Allah" (Oxford: University Press). Günther, H. F. K. (1930) Rassenkunde des jüdischen Volkes (Munich: J. F. Lehmans Verlag). Günther, H. F. K. (1934) Die nordische Rasse bei den Indogermanen Asiens (Munich: J. F. Lehmans Verlag). Lewis, B. (1990) Race and Slavery in the Middle East: An Historical Enquiry (Oxford: University Press). Mitchell, D. (1976) Pirates (London: Thames & Hudson). Payne, S. G. (1973) A History of Spain and Portugal: Volume One (Madison: University of Wisconsin Press). Reader's Digest Association (1974) The Last Two Million Years (London: Reader's Digest Association). Siragusa, G. B. [ed.] (1910) Centenario della nascità di Michele Amari (Palermo: Virzi). Sordo, E. [I. Michae, trans.] (1962) Moorish Spain: Cordoba, Seville, Granada (New York: Crown Publishers). Vollers, K. (1910) "Über Rassenfarben in der arabischen Literatur." In Siragusa (1910) pp. 84-95.
von Schwerin, H. (1960) "Nordic Elements in Afro-Asia." Northern World IV (2) pp. 24-30.
von Schwerin, H. (1964) "European Elements in Afro-Asia." Mankind Quarterly IV pp. 127-133. Weyl, N. (1967) "The Arab World: A Study of Biogenetic Disintegration." Mankind Quarterly VIII pp. 26-43.